The Recruitment & Employment Confederation has announced that there are now 1000 people engaged in a recruitment apprenticeship. 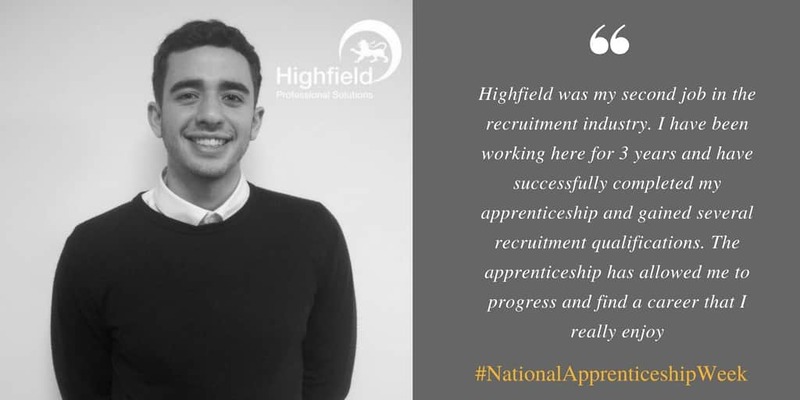 Here at Highfield we are delighted to celebrate National Apprenticeship Week, and to say that we fully invest in the training and development of our employees. Apprenticeships in recruitment are helping to professionalise the industry and enabling us to support and help people to join an industry that can transform lives. One of our success stories, Ben Smith, has now finished his apprenticeship and is working as a Recruitment Consultant within Highfield. The apprenticeship allowed Ben to gain the level of knowledge and experience needed to progress within the industry. Government data shows that apprenticeships are now available in 1,500 different job roles, covering over 170 industries. On average, it is said that apprenticeships boost productivity to business by £214 per week. It is exciting to see the growth and benefits of apprenticeships, especially within the recruitment industry.